Israeli media largely ignored how on Independence Day last Thursday, thousands of Arab citizens of Israel held a protest march in the Negev for the Nakba, a term meaning "catastrophe" in Arabic that laments how nascent Israel was not destroyed in 1948. The Nakba protest on Independence Day held in the Negev was said to be the first in the region. Maor Tzemah of the "To You Jerusalem" movement spoke to Arutz Sheva on Sunday about the incident, which was kept out of the spotlight in the Israeli press. "Last Thursday, in parallel to the Independence Day celebrations, a very large conference was held in the Negev attended by several thousand (people) led by the (Arab Higher) Monitoring Committee and the (outlawed) Islamic Movement," said Tzemah. 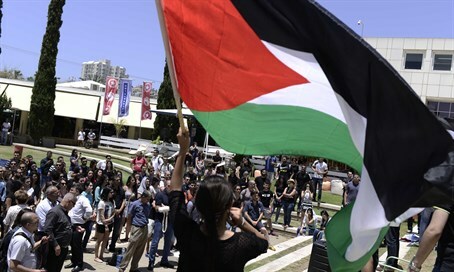 He noted that the conference bore "Palestinian national symbols," including dozens of Palestine Liberation Organization (PLO) flags, and featured pro-Palestinian speeches. Tzemah revealed that the head of the Arab Joint List party MK Ayman Odeh was also present, as was Joint List MK Mohammed Barakeh, chairperson of the Arab Higher Monitoring Committee. Video footage from the protest indicates that the Israeli police were not present at all, Tzemah said. The central message from Odeh's speech and the other speeches at the event was an emphasis on sticking to the Palestinian "right of return," indicating a call to flood Israel with the over 5 million descendants of Arab residents who left in the 1948 War of Independence to give the Arab armies freedom of operation. In Palestinian media Odeh was quoted as saying in his speech that the annual march "emphasized the right of return for our people to its villages and cities...and therefore it is said that the question of the Nakba is not a question whose place is in the past, but rather it is a question especially connected to the future, to those who were expelled...and to the Palestinian state...and (it is) the only way to repair this injustice, it is the only path to peace and justice...between the peoples." Tzemah argued that the call for the "right of return" reveals the true intention to establish a Palestinian state on the ruins of the state of Israel, and that all claims of peace and neighborliness are in essence erased by this call to flood Israel with Arabs. He noted that on Saturday another conference was held, this time in Tirat Hakarmel near Haifa, in which Odeh again took part. Presentations were screened at the event including pictures of the Arab villages of 1948 that were abandoned during the war, and pictures of the Arabs abandoning the villages. "What they forgot to tell there was that they were the ones who started the war and they were the ones who lost the war," said Tzemah. "The current leadership of the Arab Israelis is leading in the end to a definition of every Arab Israeli as part of the Israeli-Palestinian conflict," he said. Regarding the attempts to get Bedouin Arabs involved in such Nakba events, he estimated that the Bedouins are being "manipulated." "There were more than a few buses there that arrived from the 'triangle,'" he said, noting a region in northern Israel where over 300,000 Arab citizens live. "Intentionally they held (the march) in the Negev.They wanted to say that the problem is also in the south like in the north, and in Judea and Samaria, and (also did so) in order to pull the Bedouin population into the issue." Tzemah also pointed out the growing connection between the Arab Higher Monitoring Committee and the radical Islamic Movement in Israel, which was recently banned by the state. "A week ago (Islamic Movement head) Sheikh Raed Salah entered jail...and in the conference that was held in his honor members of the Arab Higher Monitoring Committee took a central part," he revealed. He also referred to the Arab march held last week from Haifa to Jerusalem in a call to "liberate" Jerusalem as part of the Nakba events. The event was also initiated by the Islamic Movement. "We stopped it. We turned to MK (David) 'Dudi' Amsalem who contacted (Internal Security) Minister Gilad Erdan, and police cars stopped the march at Shuafat, on the fringes of Jerusalem. Another incident organized by the Islamic Movement, the movement that was outlawed."